As every Wedding is unique I believe so should every Wedding Cake be. Photos of you cutting your cake will grace the pages of you Wedding album forever so make sure the cake you choose is as much of a statement as the rest of your day. Gone are the days when you had to have a traditional white tiered wedding cake. These traditional Cakes still have their place if this is what you wish but people are now able to have more adventurous designs that reflect the personality of the Bride and Groom. At Sweet's Treats we will design and make your cake to fit your taste and style while keeping in with the theme of your day. With our extensive list of flavours choices you will no doubt be able to find one that is perfect for you and the beauty of tiered wedding cakes means within reason you can have a combination of flavours in one cake so you can please everyone. We make Cupcakes for all ages and can also supply mixed boxes (1 Dozen - Minimum 6 of each flavour) These are great alternatives to traditional celebration cakes. They are supplied in boxes but for that extra wow factor you can hire a cake stand from us for a small charge. 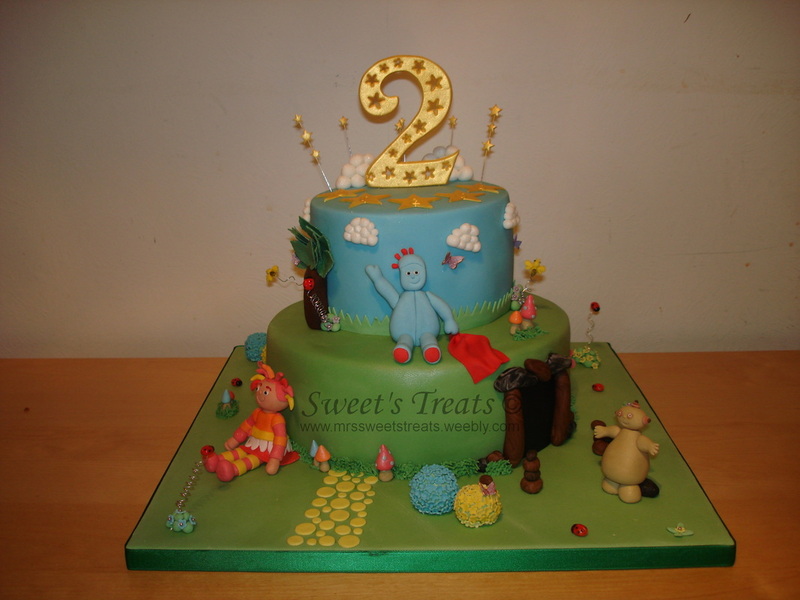 Most Cakes can be made to match a colour sceme or party theme. There are so many different flavours and they can be decorated in so many different ways that the possibilities are endless. Traditional Cup Cakes are the large muffin size Cakes, these seem to be the most popular these days but we can also supply Fairy Cake/Bun size cakes (minimum 12 of one flavour) or the even smaller Petit Four size cakes (minimum 36 of one flavour) These are bite size cakes and are great for small children who tend to take one bite out of a cake and leave the rest or just for a guest that only has room for a little Sweet Treat. A selection of all three look great displayed on a stand together and would meet all your guests needs. We can also supply individual mini cakes that serve 1 guest each (Round or Square) - These can be fully iced and decorated or wrapped to your specification. These make great wedding cakes as they can be displayed any way you want and each one can be taken home separately. So whether its a Wedding, Birthday, leaving do or just a get together with the girls these individual cakes are always a hit and allow your guest to take their whole cake home with them if they wish. 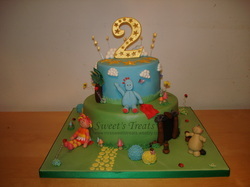 In The Night Garden Cake. A celebration cake is any other cake that is not a wedding cake. These can be made for all ages in nearly any flavour, colour or design you wish. For Birthdays we can make a variety of different styles from childrens character Cakes to more sophisticated landmark number cakes. For Christenings we can offer cakes that are very traditional or something much more modern and trendy that fits in with your theme. Occasional Cakes are just the right way to say you care, whether someone is leaving for pastures new, has passed that very important test or exam or has just annouced they're expecting a baby, we know our creations will put a smile on everyones faces and remember our cakes are only limited to your imagination.